While other adults gossip and do dishes after holiday party meals, I'm often assigned to play chess with the children. A great deal as far as I'm concerned (if you're thinking of inviting me to a party, know I never let them win)! At such an event last weekend, a pet bird interrupted, which reminded me of a striking chess set. The weekend prior, I went to Princeton with Shannon Bailey, a curator at the World Chess Hall of Fame to see Jon Crumiller's amazing collection of antique chess sets. You can see the diversity and the elegance of the collection on Jon's website & picasa galleries. One of my favorites was this ivory bird chess set. You'll always have an excuse for losing pieces: They flew away. Floyd and Bernice Sarisohn of Chess Collectors International also came to Princeton from Philadelphia, where they loaned many of the sets currently on display at the Philadelpha Art Museum's Dancing Around the Bride exhibit. 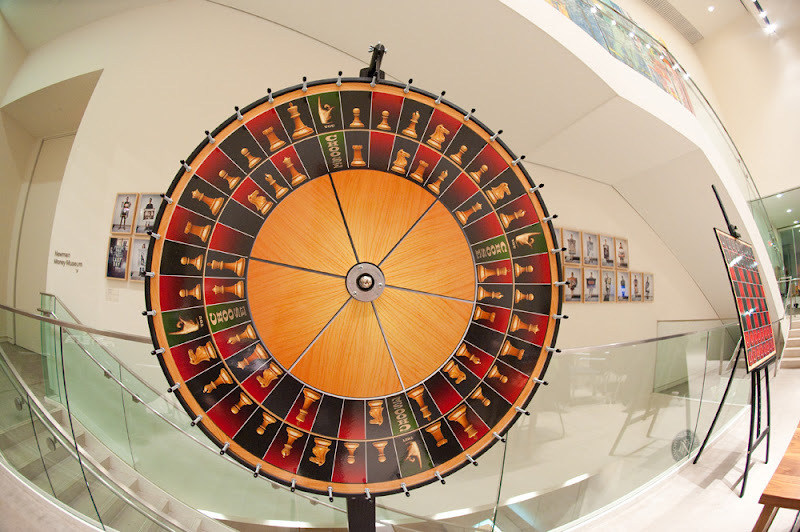 Joshua Anderson of the Chess Journalists of America wrote about the exhibition on CLO. I was at the Museum a few weeks ago to give a talk about Marcel Duchamp, chess and art at "Art After Five", a popular series where Philadelphians of all ages come to have cocktails, see art and enjoy live entertainment. I was nervous to speak to a crowd in such a festive atmosphere, so I just imagined everyone with no pawns. I was happy with the reaction to my 15 minute slideshow which touched on Duchamp's opening repertoire, his musical battle against John Cage and some of my own Duchamp inspired projects like roulette chess and hula chess. Afterward, the fantastic New York City septet Morricone Youth played music and projected video art, partly inspired by ongoing battles between me and my father and brother. In the first game against Greg, I erred in the following position. Despite this, the game was very tough to win, and we ended up circling queens for dozens of steps. I thought about asking Greg to start a new game but he is possibly the most competitive Shahade ( no easy feat! ), so I knew he wouldn't want to agree to a draw in a better position, even in an exhibition game. Meanwhile, I was captivated by the symbolism of the white and black queens moving around and around, with the captured pieces just looking on. Instead of Dancing around the bride, the brides were infinitely dancing: another hula chess reference. Eventually the bass player noticed, "you guys haven't captured a piece in about an hour, have you?" A tournament director came to the rescue when I least expected it. You can still see the Dancing Around the Bride exhibition at the Philadelphia Art Museum, on display until January 21st. CLO editor Jennifer Shahade will also be heading to Princeton from December 27-30 to cover the Pan-American Championships for the US Chess Scoop. Subscribe to our YouTube channel for video notifications.